Rocket Liftoff Aborted A Half-Second Before Launch : The Two-Way The privately funded, unmanned spacecraft was attempting its first flight to the International Space Station. The spacecraft had a one-second window to take off, and the failed launch means it won't be trying again for at least a few days. Moments after ignition, a privately funded spacecraft aborted its liftoff, delaying its mission to the International Space Station. SpaceX's unmanned rocket had a one-second window to take off from Cape Canaveral in Florida on Saturday morning, and the failed launch means the next opportunity won't be until early Tuesday morning. The founder of SpaceX, Elon Musk, had been tweeting from the company's California headquarters leading up to the scheduled launch time of 4:55 a.m. ET. "Whatever happens today, we could not have done it without @NASA, but errors are ours alone and me most of all," he said. The successful launch would have been just the beginning in a series of tests for the private spacecraft. The Dragon capsule, perched atop the Falcon 9 rocket, would become the first commercial spacecraft to visit the International Space Station. 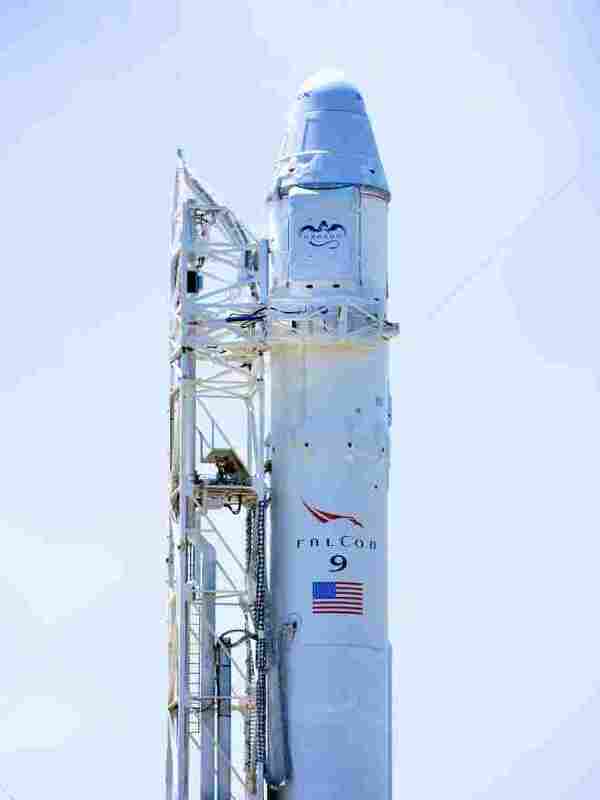 Even after it eventually launches, though, it will be a few days — filled with more trials — before the Dragon can berth. As the AP reports, it was the Falcon 9's onboard computers that shut the operation down with just a half-second to launch. Even NASA's most seasoned launch commentator was taken off-guard. SpaceX President Gwynne Shotwell confirmed Elon Musk's earlier tweet that the high-combustion chamber pressure in engine No. 5 was to blame for the shutdown. Technicians are investigating further; if they need it, there's a spare engine available. In a briefing after the launch attempt, SpaceX president Gwynne Shotwell likened the process to a commercial pilot revving the plane's engines before taking off. "We were revving the engines, looking at the gauges, and we decided not to fly," she said. She also said that the required wait time between launches has to do with the trajectory of the space station. The next chance to launch will be either 3:44 a.m. ET on Tuesday or 3:22 a.m. on Wednesday. Musk gives an indication of what prevented the launch via Twitter: "slightly high combustion chamber pressure on engine 5. Will adjust limits for countdown in a few days." NASA says, "the teams will continue to look at the data and assess a launch attempt on May 22." NASA will host a briefing at 6:30 a.m. ET on NASA TV. "NASA decides if Dragon is allowed to attempt to berth with the station. If so, Dragon approaches; it is captured by [the] station's robotic arm and attached to the station. This requires extreme precision even as both Dragon and station orbit the Earth every 90 minutes." This mission will involve only nonessential cargo, so the six astronauts aboard the space station will be able to get by if they don't get the goods. After about two weeks, Dragon should detach and come back to Earth with a splash in the Pacific. The mission presents challenges from start to finish, The Christian Science Monitor says. "The mission is technically demanding – cramming into one orbital outing an agenda that the Gemini program in the 1960s took several missions to accomplish." "The highly anticipated mission could mark the beginning of what some say could be a new era in spaceflight, with private companies operating taxi services that could start taking people to orbit in just a few years." So far only Europe, Russia, Japan and the U.S. have sent spacecraft to the space station. "There's no question this is a historic flight," SpaceX President Gwynne Shotwell said at a news conference Friday, as reported by the AP. It won't be the only first for SpaceX, either, as NASA notes. It launched the same rocket and spacecraft in 2010, becoming "the first private organization to launch and recover a spacecraft from Earth orbit." SpaceX says the capsule is designed to hold both cargo and people. The AP says the company will stick to supplies for now, but "within three or four years, the goal is to have astronauts on board so Americans no longer have to hitch expensive rides on Russian rockets." The NASA space shuttle program ended last summer with the launch of Atlantis. At that point, NASA turned to the private sector for delivery duties, the AP says. SpaceX has been working closely with NASA to prepare for this mission, all the while working through cultural differences between the entities, Greenfieldboyce reports. "If any aspect of the mission is not successful, SpaceX will learn from the experience and try again."